The Chinese ereader maker Onyx might not have the largest share of the global ebook reader market but they do have some of the more industrious and ambitious designers. I have just found (via MobileRead) a spec sheet for the Onyx Boox i86. This big and beautiful ereader has an 8" screen with a resolution of 1600 x 1200. At 250ppi this screen isn't quite as sharp as the 6.8" screen on the Kobo Aura HD, but it comes close. The Onyx Boox i86 runs Android 4.0 on a 1GHZ CPU with 512MB RAM, 4GB Flash storage, and a microSD card slot. It also has Wifi and Bluetooth. On top of the high resolution screen you'll find a frontlight and an IR touchscreen from Neonode. I can also confirm that this device has at least one speaker or a headphone jack; one of the listed features is text to speech (provided by Ivona). In terms of software, the i86 is probably running the same reading app as on Onyx's other Android-based ebook readers (with the same note-taking and scribbling abilities). The spec sheet lists the usual broad range of format support, including ebook formats like PDF, Epub, and FB2 in addition to document formats like Doc, CHM, html, and RTF. There's also support for MP3 playback. The spec sheet also lists the i86 as having a Pearl E-ink screen, and not the newer Carta screen, which makes sense. This is one of E-ink's existing screen sizes, and it is actually on the market. 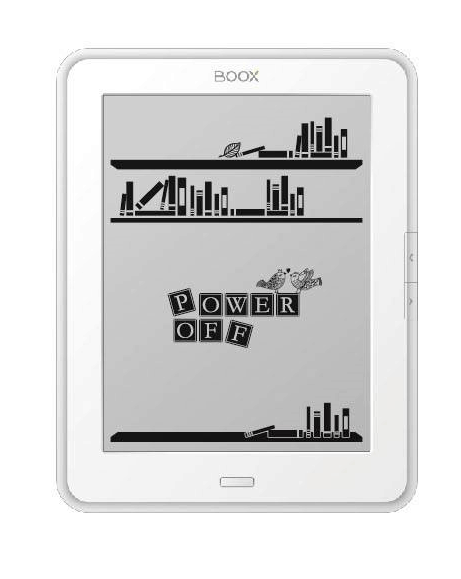 This 8" screen unit is used in the Pocketbook Color Lux ebook reader. That device has an 8" color E-ink screen, and because it has a color E-ink screen the Lux also has a quarter the screen resolution (800 x 600). E-ink creates a color screen by placing a color filter on top of a black and white E-ink screen. The filter changes each of the pixels in the underlying screen to either red, green, or blue, and it also leaves a 4th pixel as b/w. Because the color E-ink screen takes 4 pixels to display one color pixel (RGBW), it reduces the screen resolution by 75%. Along with a grey tinge, the problem with screen resolution is one of the reasons I don't like color E-ink screens. I'm glad to see someone using the 8" screen sans color filter, and I hope to see it on the market. The specs read really promising. I wonder whether the Android will be upgraded though. It would be nice to get support for Bluetooth LE and Miracast with newer versions of Android and I hope that the hardware at least supports that. Could you find out which specific processor they’re going to use? Also, is there a higher resolution version of the spec sheet? Some entries in the table are hard to decipher. Also, if this comment can be posted, I’d like to inform you that your comment system is somehow broken since your last post about an invisible captcha. Whenever I tried to post, I got redirected to a page from your web site with a 404 error green creature image. I’m on a different setup now and hope that it works this time, but I don’t usually use this and thus won’t be able to send comments most of the time. Test. The first time I tried to post the above comment, it didn’t work again. Then I chaged a setting (send referrer) and it worked. Now changed some other settings to see whether it still works. Apparently, it worked. So in order to avoid the error page, it seems necessary to advise the browser to send some referrer. The error page was not helpful in that respect. Maybe it can be changed back to the original behaviour before the last post about invisible captchas (since it used to work back then). There are no captchas, invisible or otherwise, on this blog. Click on a link in the sidebar. I did not see above page before the captcha with the number + word = answer was removed (and not either before it was introduced). Now, in order to avoid the error page and successfully send a comment to the moderation queue, a setting in the browser to send a referrer seems to be necessary. Not too much of an issue, but still means some extra work, and the error page gave no helpful hint that would have pointed to the problem. And just to be safe I reinstalled the latest version of WordPress. That should fix whatever problems you may have encountered. This device sounds pretty high end for an eReader, which shows the (compared to tablets) poor hardware eReaders suffer from. Still, for the lack of better options, I think I’ll seriously consider buying this one once it is available. 512 MB Ram, the high resolution screen make it sound like it could be a good option for reading PDF – I do that on a tablet now, but LCD just offers way to many distractions for me. This seems to be very exciting year for ereader thanks to Onyx. So that 13.3″ device is confirmed? I have heard rumors but nothing definite. (not to boast,well actually yes;), but it’s me who started that thread but I would never imagine that so many great news from so many people will follow. I wished Onyx wouldn’t use Facebook. Why don’t they care more to maintain their own web site, on which no information about T68 and i86 can be found? Or did I overlook it? You’re right that they don’t maintain their website; this isn’t the first time that I’ve had to look elsewhere for details on Onyx products. Has Onyx Officially partnered with Ivona? Earlier, only devices from Artatech distribution had Ivona TTS. Onyx C65 available at eBay doesn’t mention Ivona anywhere. That’s a good point. I’ll ask Onyx. All i know at this point is that the spec sheet lists Ivona. If you write them an email, please also ask for the processoer model (i.e., iMX 6 Solo, DualLite, Dual, or something else) and whether Bluetooth LE would be supported at a later time with an Android upgrade. And while you’re at it, since the spec sheet mentions an open SDK, please also enquire whether that would allow people to create custom firmware for their devices. Thanks in advance! Will bluetooth support allow us to use bluetooth keyboards with ereaders finally? Will be avalaible in Spain? Else, will be shipped through internet? ?